The studio benefits from the spaciousness of the suburbs–this standalone building with its name emblazoned on it in 5000 point font is impossible to miss. It even boasts its own parking lot. The 2-story studio is gorgeous, comfortable, and high-tech; the yoga room is highly insulated to outside sound so you won’t hear cars and can focus intently on your practice. There are massage and healing rooms and the hallways are roomy and airy. Room temperature is effortlessly regulated through modern heating and cooling. There is a large locker room changing area and showers. It’s the kind of place I could spend a whole day lounging in. For some yogis, my sense is that they may find this studio a bit too perfect and manicured; if you prefer the studios with “character” like the yoga studios converted from old houses in San Francisco with their “old wooden house” smell, unique floor layout, and sometimes uneven or creaking wooden floor panels, this studio is the opposite. I found the vinyasa practices here to be peaceful, uncrowded, and moderate in difficulty level. The power yoga and vinyasa classes are accessible to a wide range of skill levels and the teachers offer a lot of modifications. I have practiced with Joanie, Hana, Louis, Cheryl, and John at the studio. Joanie and Hana practiced along and demonstrated almost all of the poses. John Berg (he is also the studio’s owner,) welcomes everyone as family. He is very enthusiastic about every single pose and his style is to demonstrate some sequences and move around the room but he says in his own words that “it’s not my style to tug and pull you into shape” so he isn’t the type to offer hands on adjustments. Cheryl is the opposite and is very hands on with adjustments (I always hope that when she walks by, she is going to give me an assist!) Louis Jackson offers the most advanced physical practice here and his class is the one that I feel I can grow physical practice with. My observation was that the yogis who practice here are less experienced than those in the city studios I have visited or at Vibe Yoga in Redwood City and perhaps that is why the teachers felt that they needed to demonstrate more poses. 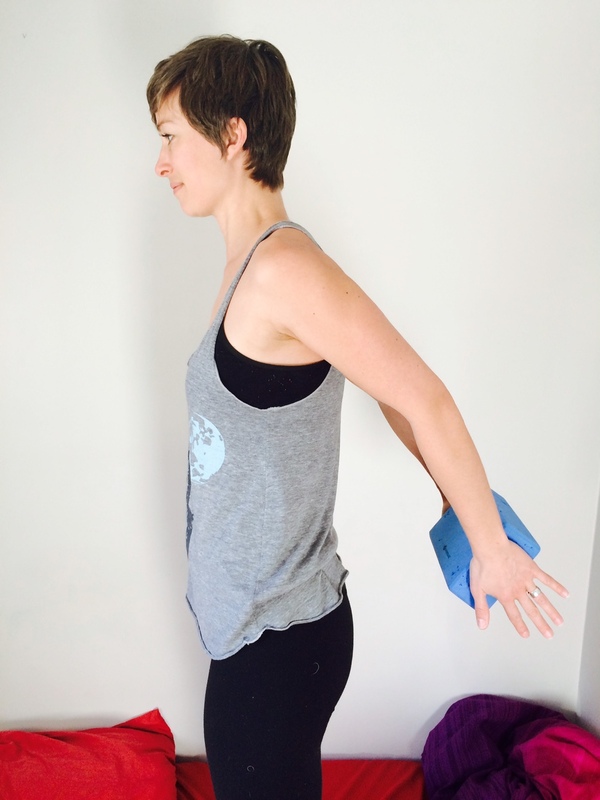 In almost all of my level 2+ yoga classes in San Francisco, the instructors expected you to have a general idea of all of the basic and intermediate-level yoga poses or they would verbally cue you and they would spend all of their time walking around and making adjustments. Many yoga teachers didn’t even have a mat towards the front of the room and they would only stop to demonstrate some more advanced poses. I have taken class here with Irene Au, Helen Christine, Elena Milyukova, Toni Cupal, Tyler Hoffman, Evangeline Ventura, Janya Wongsopa, and Thoa van Seventer. While Irene’s class was a beginners level class, she offered creative ways to do common flows and I was inspired after her class to buy a 5-pack; plus, they have a new student special where you get 50% off any class package (up to 50 classes) which helped me make the decision to give them a try. I felt that Elena’s 8am on Sunday class and Helen’s Sunday Stretch class was still quite basic and accessible to newer yogis but Elena does offer some inversions and hands on adjustments. Toni teaches on Mondays and Thursdays at Avalon and she is one of the more advanced teachers. For those who aren’t familiar, Jivamukti classes involve some singing. I really enjoyed how she gave everyone hands on adjustments and the warmth she brings to classes. She also started a Jivamukti yoga studio in London. After taking Toni’s class, I decided to sign up for another 10 class package. I also visited Tyler Hoffman’s Monday evening class, and he is another teacher who offers hands on adjustments. The distinctive part of Tyler’s class is that he instructs where your drishti, or your eyes should focus on and he has a calming baritone voice, the kind that you would want reading you an audiobook or instructing you on meditation before you fall asleep. Evangeline Ventura teaches a more hatha class, offering hands on adjustments and natural oils; her class is accessible for beginners. Thoa van Seventer said her classes vary from intense to relaxed and the class I went to with her was more on the relaxed / easy side. Janya Wongsopa’s Yin/Yang class is 95% Yin, so it’s great if you want to get a good stretch in but you won’t be moving strongly. In general, I would say that Avalon is a good yoga studio for those who are newer to yoga or yogis who want to focus more on alignment and the mental benefits of yoga. It is not a “workout” studio. My 2 favorite teachers, Toni and Tyler, don’t teach on weekends so I’m not sure I will continue going to this studio after I use this set of passes. 1.) Wide range of teaching styles and high quality teachers, albeit more focused towards the mental instead of the physical aspects of the practice. At least one of the teachers is Thai and she offers a retreat to her hometown. Yoga is Youthfulness specializes in Ashtanga and Mysore. My favorite class here is the handstand clinic on Thursday nights with Julianne Rice. Julianne gets to the point and you focus on technique. Just when you start to master one technique, she pushes you to advance to the next one, so you are constantly being challenged. All the teachers, including Julianne, have been practicing yoga for decades and I appreciate that this studio is not a yoga teacher “starter” studio because it generally doesn’t hire yoga teachers who are just dabbling in the practice or only recently started teaching. The best part of this studio is its heated yoga room. On a cold or rainy winter day in the Bay Area, practice at this yoga studio leaves you feeling like you are on a warm “high”. Your limbs feel stretched out and toned and you feel very calm. I haven’t felt this way after hot yoga practice in most yoga studios in the Bay Area. Turbo 26 Studio does tout its proprietary “healthy heat” heating system that is described in detail here. Having been to many heated yoga studios, I will say that the heat in this yoga room was just perfect. It was heated to 98 degrees with 38% humidity in the room. The room was on the smaller side and there were 15 people in the room but it wasn’t smelly at all. The style of exercise leans towards “fitness”–the room has a great sound system so the instructor blasted the music and it was a “get down to business” type of attitude on the mat. Jake also counted: “Meet in downward down in 3, 2, 1, and… ” I have never had a teacher who counted down the seconds to meet in a specific yoga pose. In Barre class, you do move to the beat and that was the closest thing I could compare it to. I also took a class with Kelsey who taught with the music on, but not pounding, and who had more of a flow-like feel (with no counting down.) The majority of the teachers here trained at the “cookie-cutter” CorePower chain. Turbo 26 Studio also boasts 26 minute classes that are “stackable” so you can take two to make it a longer class or if you only have 26 minutes, you can get in and out of there. It’s an interesting model but it definitely felt like it catered towards busy professionals who wanted a “fitness” routine and cared less about the spiritual aspects of yoga. I stopped by the 1-hour advanced flow class with Jake and I thought it felt pretty introductory in terms of flow but I still enjoyed the class and left feeling refreshed. Because the style is “stackable” blocks of classes, the classes feel very fast and you don’t stretch that much because it has to accommodate people coming in and out every 26 minutes. Therefore, there isn’t a warm up or cool down Savasana section of the class. 2.) Their “Advanced” class didn’t feel very advanced to me; the most advanced pose suggested was eka pada utkatasana, (flying figure four pose). As an “Advanced” class, I would have wanted to be more challenged further. YogaWorks is a chain and they have many locations across the United States. I visit the Back Bay location whenever I am in Boston and thought I would give the Palo Alto location a try. Although YogaWorks is a chain, each location seems to be very different in terms of amenities, types of classes, and the instructors’ level of training. The Palo Alto location is a more “bare bones” location. They do not have showers or changing rooms. There is a single-occupancy bathroom. I went to a level 2 class with Eden Mendel. The sequence of flow and music was great but Eden likes to tell stories about her week during the practice so she would forget which side she was on which I found to be a little bit annoying. For a level 2 class, the majority of guests were “beginner” level yogis and Pincha Mayurasana (forearm stand) was the most advanced pose we practiced. This studio is close to downtown Los Altos which makes it “convenient” for a suburban yoga studio. You can run some errands / go to the grocery stores nearby and parking is plentiful. Google Maps directions take you to the back of the studio which is a bit confusing because the building is sandwiched between other buildings so it looks “closed” from the back. If find yourself in the back of the building, locked out, there is a little alleyway to the right of the building if you are facing the back which you can walk through. The front of the building is much more welcoming. I took a class with Nicole Reynolds (who was substituting for Aislinn Coleman.) I wasn’t blown away by the class because the flows weren’t incredibly innovative and the Vinyasa Strong Flow Level 1-2 class I went to felt more like a Level 1 class to me. However, there was one challenging moment when she taught grasshopper pose and that inspired me to practice more arm balances. I love hands on adjustments but unfortunately she didn’t provide many throughout the class. During savasana, she did give us all a short leg massage which was really great. The studio space itself has a bit of an awkward set-up. There is a front desk with some seating along the windows and a cubby shelf to store things. The bathrooms are behind the yoga studio though so you can’t go before class if there is already a class in the studio. I first visited Vibe Yoga to attend a Shoulders and Heart Openers workshop with Carmen Aguilar. It’s not fair to compare a $70 workshop with a yoga evangelist like Carmen to a “regular” yoga class but I will say that Carmen’s class was one of the most challenging and rewarding yoga classes I have been to in a while and I highly encourage everyone to attend workshops with her if she travels to your city (she is based in Chicago but comes to the Bay Area at least twice a year.) Carmen beautifully links poses and leads her classes with the expertise that can only be developed from at least a couple decades of practice and teaching. Her style is “get down to business” and focused on proper alignment and technique. She helps your body move in ways you never thought possible. Memberships at Vibe were transferred over to this new yoga studio when the owner, Rebecca, closed down Vibe and relocated to this new location. For some students, the MindBody membership transition didn’t happen so just let them know when you are there in person and they can manually transfer your remaining classes over. The teachers are almost entirely different than those at Vibe Yoga and the experience is very different than that of Vibe Yoga. First of all, Vibe Yoga was a gorgeous space with high ceilings, 2 yoga studios, a spacious retail / waiting area, and showers. Because I was thinking of this new studio as a “Vibe replacement,” the physical space is definitely disappointing in comparison: It is just a room and has no waiting area so you have to wait outside the yoga studio if there is a class going on. There is one bathroom in the back and one small corner with a curtain where you can change. There are fewer props than at Vibe as well. While the floor is cushiony, helping your joints in Frog Pose, for example, it makes standing poses harder (which I suppose is fine because it’s also a good challenge.) The most interesting thing about this studio is that they do not list their teachers on the website. I practiced next to one of the teachers there and she said the goal was to make it less political because some teachers at Vibe would be paid more because more students showed up to their classes. While I admire the desire to make compensation more fair for all teachers, there is a reason that teachers like Jonathan Rickert had a following–you could learn a lot from practicing with him and he taught very challenging transitions and asanas. 1.) I didn’t get a sense that the teachers (except for perhaps the studio owner) were very advanced at their own practice, which I would expect given that they don’t list the names of teachers on their website, which helps newer teachers but doesn’t help more advanced teachers. My yoga teacher gave me a lot of hands on adjustments which I really appreciate because not only does it feel great, it helps push me into deeper poses though. 2.) The studio space really is a bit too small. I was confused when I first showed up, thinking there was another entrance I should go through in the back to check-in. I even walked all the way around the building to check before I went back to the front and realized I just needed to wait until the previous class completed. This studio isn’t on the main Castro Street–it’s in a parking lot next to Castro Street. Google Maps takes you to the right place but Waze takes you to the main street where you cannot see the studio (this may change in the future now that Google Maps owns Waze.) The space is an unassuming room with a small check-in & waiting area and a few changing stalls built into the side of the wall. The bathrooms are part of the whole retail complex and you have to exit the studio with a key to use the bathroom. I’m used to nice yoga bathrooms with organic hand soaps that this was a little off putting. I did like that the studio is heated (some people love this, some people hate it,) but in the middle of winter, I love hot yoga. The instructor, Andrew Goldberg, said to try out a few teachers before making up your mind about the studio since everyone is a bit unique and I will take this advice to heart. I’ll return and try out a different class with a different instructor since I didn’t like how easy the “Yoga Belly” class was and didn’t like the “inspirational” stories that the instructor tried to weave in–that combined with his occasional swear words made it so I didn’t feel very relaxed after I left the studio. But I do want to return to try out either the “YBX” or “YB Ballerz” classes. This CorePower has 3 practice rooms so it can offer numerous classes each day. I had attended a Made To Fly workshop with a friend who was a member there. The 90-minute workshop was taught by Brit, the studio manager. Brit explained the alignment of each posture well and she had someone else helping out with hands on assists, so even though there were lots of folks at the workshop, you still got some attention. When you look up at the ceiling, the heating grates are covered and the sound system is quite good (I think it’s a relatively newer building) so in terms of facilities, it reminded me of a Barry’s Bootcamp or SoulCycle in terms of facilities (showers, shampoo, etc.) although I do think you have to bring your own towel or rent one for $3. 1.) Ample parking, great location next to a giant Whole Foods (I’m always hungry after working out,) and the studio space itself plus the amenities are quite nice. 1.) Most CorePower instructors are pretty junior in their yoga practice. While Brit was a great teacher, I could also see that she was still relatively new at practicing yoga too. It was an inversion class so Brit showed some fun inverted transitions and poses, but other workshops I have been to featured instructors who were much more grounded in their practice (e.g. 20+ years of practice). Several locations in Shanghai—search for the nearest location to you using Baidu Maps if you are in China; you can use Google Maps if you are outside China. I visited the Y+ Yoga located at 308 Anfu Rd, Xuhui Xu, Shanghai Shi, China 200000 (Google Maps address) but there are a total of 4 locations in Shanghai. Note that the location I went to is not well marked and it’s on the third floor of a building. You have to trust the Baidu Maps GPS and just turn into the building when your dot says you have arrived and go up the stairs (or take the elevator to the third floor.) There isn’t a sign on the outside marking the yoga studio (although it looked like that building was being remodeled the time I went so it may have a sign by now.) Y+ Yoga has many classes each day and seems to be membership prices driven; their drop-in class prices can be steep (300 RMB for a drop-in class, equivalent to about USD$46) but they do have a new student special that is 399 RMB for 5 classes. I attended Sergeii’s Flow Level 2 class and it was very interesting to hear Mandarin Chinese around me from the yoginis but to do a yoga practice led by an English-speaking teacher who had a Russian accent. When he said the word “warrior,” it sounded like “water” to me. Sergeii was a “get down to business” yoga teacher and he made sure everyone got to practice handstands and forearm stand with him spotting them and he offered hands on adjustments which I appreciated. 2.) Cannot find the yoga class schedule on their website (or it’s very difficult to find and I never discovered it); I later WeChat Nina and she sent me the PDFs which I have posted below. In the schedules below, the stars next to the classes below denote the difficulty. A class with 4 stars is more difficult than a class with 3 stars. I was traveling for work and had one day to try a yoga studio in Houston, TX. Although YogaWorks is a chain (and possibly a franchise,) it does have its distinct flavor in each city and I’ve enjoyed their classes in Boston and Palo Alto so I stopped by YogaWorks Uptown Houston. I chatted with the teachers and studio workers and they mentioned that it was odd that California did not have many heated yoga studios (I guess the weather is so nice year round or it just never caught on.) Many yoga studios in Houston are heated and YogaWorks had 2 rooms, one that was heated and one that was not. I ended up taking Caron Lamay’s Hot 60 class. I was able to visit one yoga studio in Paris during my time there but I hope to be back since I loved the city and will add more studio reviews in the future! Unlike the San Francisco Bay Area, working out (putting on exercise clothes and going to do an activity where the only goal is to sweat) is not a big part of the Parisian lifestyle and fitness studios are difficult to find. There is a smattering of yoga studios and teachers throughout the city. I visited Rasa Yoga and loved it. I took a morning Ashtanga 1/2 class and there were 2 other Americans amongst a group of 10 or so French yoginis. As with traditional Ashtanga practices, the practice begins with a set of Ashtanga sequences and then diverges based on what the teacher wants to work on that day. The teacher (I believe her name is Anais) offered many hands on adjustments and demonstrations throughout the class. At the request of one of the Americans, she also included some English into the practice. The skill-level of this class is accurately advertised as a 1/2 class but the skill-level of the participating yoginis was generally a 1 so the teacher didn’t lead that many advanced poses–just a few, geared towards about 2 of the yoginis. The studio itself is quite nice: It is clean and they offer mats for you to use for free and mat cleaner (although the cost of a yoga class is about $25 / 22 euros–interestingly, I found the yoga classes in Europe to be more expensive than the yoga classes in the Bay Area.) 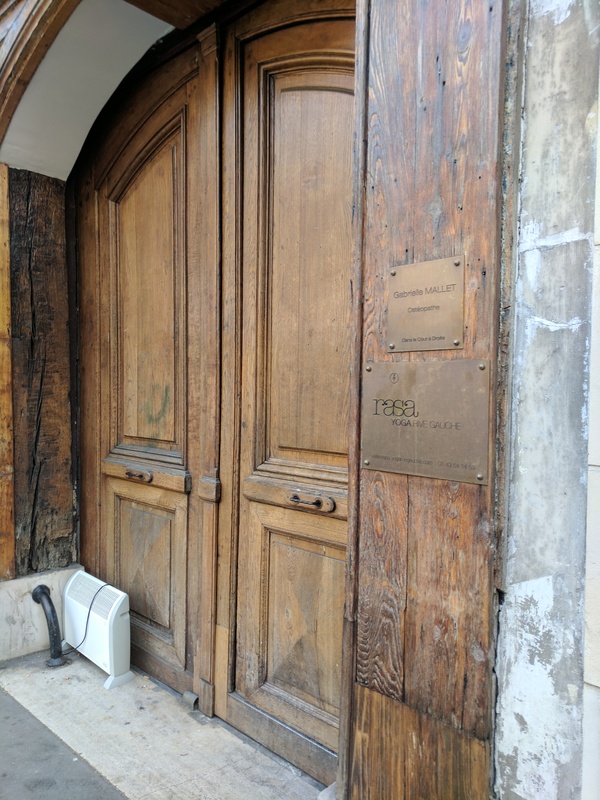 Like many apartments in Paris, the studio is located inside one of the building complexes that has a code to unlock the door (the studio doesn’t face the street.) I didn’t know the passcode to enter (I think it may be buried somewhere on their website but I didn’t find it.) Luckily, another yogini was exiting right when I needed to enter so I didn’t need to enter in the code. The studio isn’t that well-marked (see picture below to help you identify its location,) but Google Maps does take you to the right location if you follow it precisely.